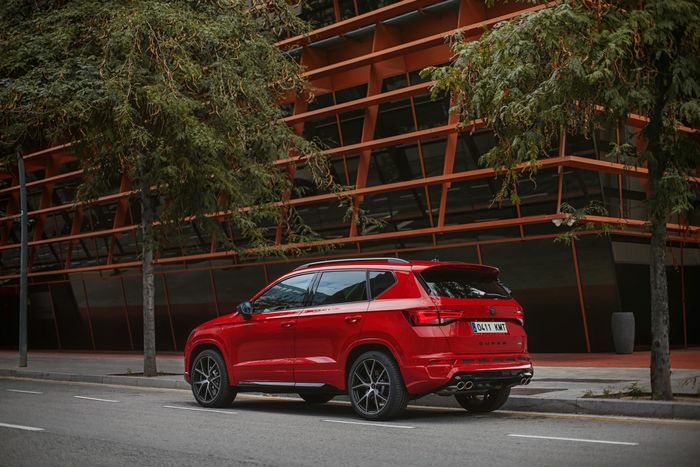 It’s easy to get distracted when summing-up the Cupra Ateca. That’s because there are two distinct things to talk about here: what the car is actually like, and whether or not it was a good decision for Seat to turn Cupra into a standalone brand. So it’s probably best we split this review in two, and discuss the car first. 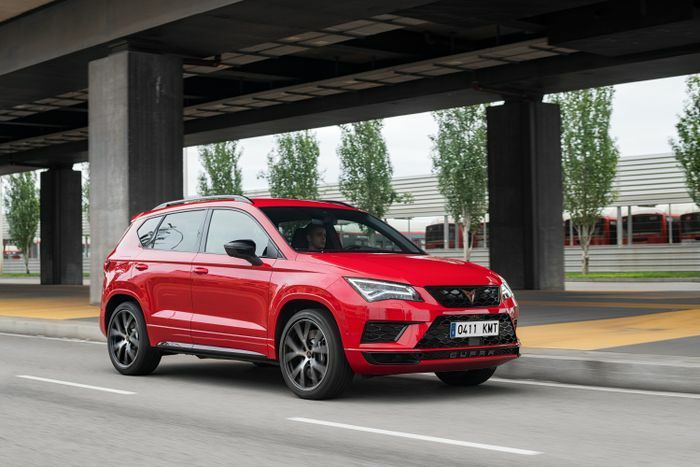 The not a Seat uses Seat’s Ateca SUV as a base and is by far the most powerful version of the crossover we’ve yet seen - the next one down from this makes do with over 100bhp less. This version uses the now very familiar gizzards of the VW Golf R and Seat’s own Leon Cupra ST 4Drive - which is still called a Seat, by the way - mating a 296bhp ‘EA888’ inline-four turbo engine to a Haldex-based four-wheel drive system. As such, there’s nothing massively surprising about the way the Cupra Ateca drives. There’s the usual strong, responsive and fairly linear attitude of the 2.0-litre engine, which will happily punt you forward at a pleasantly brisk rate. 0-62mph takes 5.2 seconds, and the top speed is 153mph. The steering is light, fast and fairly un-involving, while the supply of traction feels like it’ll never end. It does though, eventually, at which point the nose washes wide into safe and predictable understeer, or very occasionally under the right conditions, a very brief four-wheel drift. Although the four-wheel drive system can theoretically send up to 100 per cent of power to the back, you’re never going to feel the back end doing anything interesting, because Haldex says no. But like I said, we’re plenty used to front-biased four-wheel drive fast VW Groups cars that drive this way, and it’s generally quite entertaining to chuck this big, reasonably tall SUV around and lean on its capabilities. It’s 150kg heavier than the aforementioned Golf R and has a much higher centre of gravity, but it’s not as hamstrung by its crossover base as I’d been expecting. The brakes are strong even if you don’t go for the optional Brembo stoppers, it can still rapidly change direction without getting flustered, and body roll is kept in check by the standard-fit adaptive dampers. Even in Comfort mode - where you’d expect all the stability of a half-baked Victoria sponge cake - it doesn’t tilt all that much. 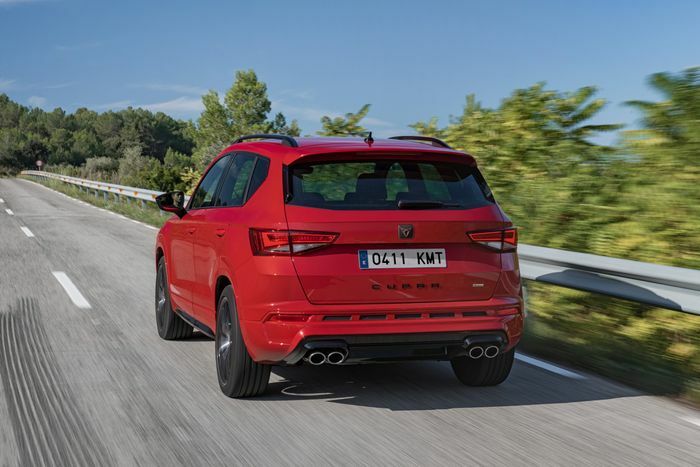 In fact, there isn’t much distinction between the different driver settings, with perhaps the biggest change when switching to Sport or the Cupra mode from Comfort being the steering weight and speed. Curiously, you seem to get a ruder exhaust note in Sport than Cupra, and on the subject of noise, it’s worth pointing out there’s no resonator in the bulkhead like in other 888-engined VW Group cars - all the sound you hear in the cabin is natural. Back in the UK, I suspect the ride is going to be on the firm side in all modes, but with a roomy interior, a 485-litre boot and the option to drop the rear seats and fill the load bay with various lifestyle things, it should be easy to live with. But while we’re having a poke around inside, it must be said that the interior’s a pretty drab space. 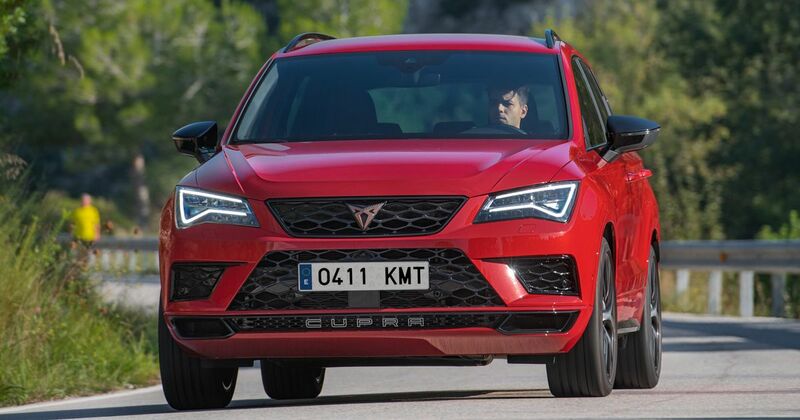 The cabins of Cupra-branded Seat often disappoint in this regard, but with the Spanish firm pushing hard to give Cupra its own identity, it’s a shame so little has been done to liven things up in there. 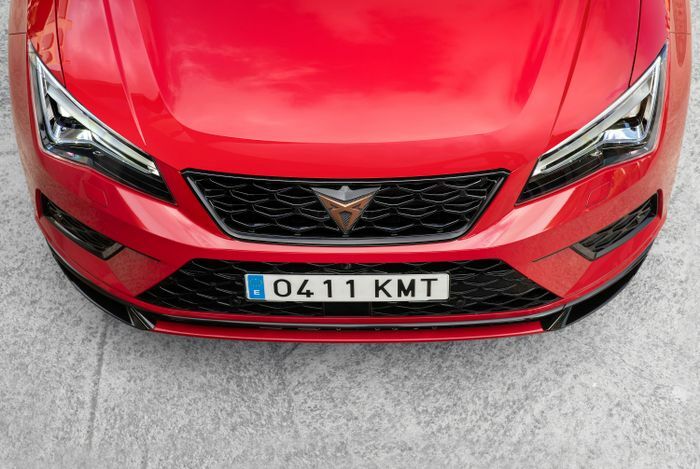 You get Cupra-branded floor mats, some weird carbonfibre-like textured stuff - which reminds me of rattan garden furniture - on the doors, seats and steering wheel, and that’s about it. The exterior conversion is a little more complete, however: you get a row of (fake) bumper vents, massive Cupra lettering on the boot lid, suitably spangly 19-inch wheels (several designs are available) and a hilariously chunky new lower section for the front bumper. And Cupra logos. And this is where we have to steer the conversation towards the whole branding split thing. The ‘tribal’ Cupra logo - sat on a triangular piece of carbonfibre on the front grille - looks like something from a knock-off Transformers film. It’s worse on the back - the rounded square shape where the Seat badge once sat is still there, replaced with another piece of probably-not-carbonfibre upon which that same tribal logo sits. Presumably, the designers would have rather had a whole new boot lid skin with a nice triangle shape cut into it so the rear logo could match the front’s; something that would be too expensive to do given the lower volumes involved here. Understandable, yes, but the results look awkward. For me, dropping the Seat name and badging doesn’t add anything, other than a slight air of naffness. It strikes me as an odd decision when Seat is already supposed to be the youthful, sporty brand of the VW Group - doesn’t syphoning off the sportiest bit of the company detract from that? And is Cupra really enough of a household name to warrant being relaunched on its own? Seat’s done the research and is adamant this is going to work, but it’s hard not to be doubtful. You also have to wonder - impressive though it is - if a Cuprafied Ateca is the right starting point. Not necessarily because it’s an SUV - worldwide crossover dominance makes that choice unsurprising - but its execution is just a bit safe and a bit predictable. Had Cupra wanted to make a grand entrance into the world, it could have done with turning things up to 11, not 7 or 8. Ironically though, the Cupra Ateca’s very familiar recipe has given birth to something that doesn’t - at the moment - have any direct rivals. The inbound Audi SQ2 is a more premium offering and is one size down from the Ateca, and it’s the same story with the BMW X2 M40i. The rumoured VW Tiguan R, meanwhile, won’t be here for a while. Would you rather see a Seat badge on the front of the Cupra Ateca? 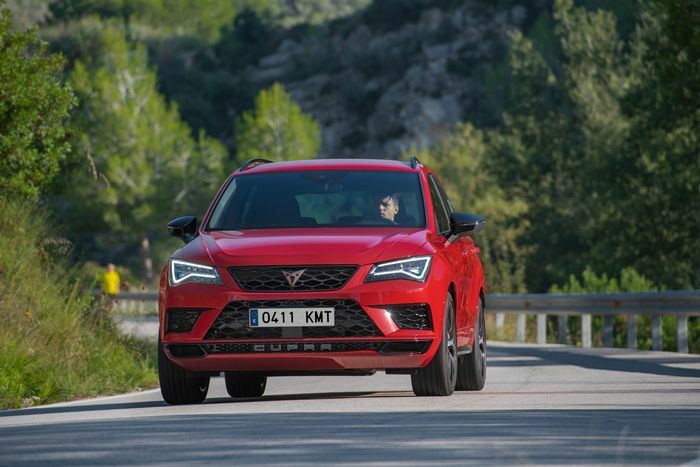 The Leon Cupra ST ticks most of the same boxes while being faster, more agile and a good chunk less expensive than this £35,900 Ateca, but few prospective buyers are going to be convinced that they don’t actually need an SUV. So for this kind of money, the Cupra Ateca is the default choice, and that’s no bad thing, as there’s a lot to like about it. I’d just like it more if it was still called a ‘Seat’.